Dental check-ups and professional dental cleaning are two of the most important preventive measures for your overall oral health. They are not just designed for adults of all ages but also for children and teens. At Cardiff Dental, we help parents make their child’s first visit as positive and enjoyable as possible. We want your child to be comfortable with our entire dental team and relax at all times, especially during their check-ups and cleaning. We invite you to take advantage of this free service we provide. The dentist aims to provide a good dental home care for the child. The dentist keeps accurate records of the child’s current oral health and dental development. The dentist educates parents and kids during the visit. This can include introducing several ways to improve the health of teeth such as sealants and fluoride treatments. Dental education includes providing the parents with suggestions to consider dietary changes if needed, and ways to maintain good oral health of their child. The dentist will use X-rays to identify tiny cavities in baby teeth. Unchecked cavities can turn into large cavities and eventually childhood gum disease. Dental x-rays will only be used if the dentist suspects cavities or any orthodontic issues. 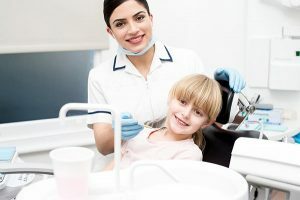 At Cardiff Dental, we recommend twice yearly teeth cleaning (prophylaxis teeth cleaning) for children to guarantee that food deposits and plaque build-up on their teeth are removed efficiently. During the dental cleaning appointment, the teeth may be cleaned using a special tool, (called a prophy brush), and a special toothpaste. On the other hand, the dentist might use an ultrasonic scaler for older children to remove the calculus. Bringing your child in for regular cleanings is a great preventive measure that helps keep oral health diseases at bay. Your dental team at Cardiff Dental will be able to detect and monitor early signs of problems that could result in more serious and possibly costlier procedures in the future. Give your child the care they deserve. You can start with us at Cardiff Dental. Our dental professionals and entire staff strive to make your child’s experience safe, comfortable and fun. Schedule an appointment with us today and claim the 6-Monthly Free Dental Check-up for your kids. Contact us on (02) 4954 6888 today!